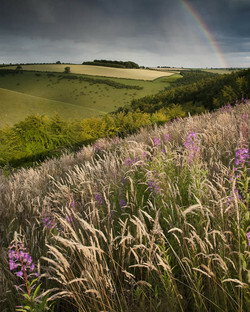 Paul is a Yorkshire Wolds based landscape photographer who spends his time exploring the hidden dry chalk dales that are a unique feature of the area. 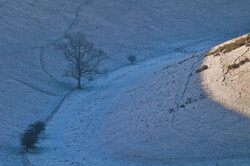 His images have been used to publicise the Yorkshire Wolds Way National Trail. I’m sure many of you are aware that the Bradford-born artist David Hockney has recently filled the walls of the Royal Academy with an exhibition of his landscape paintings, iPad drawings and multi-screen HD films most of which were produced in the East Riding of Yorkshire. 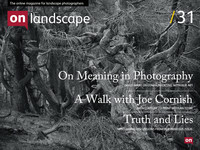 Whilst it may not be of great significance to landscape photographers it is certainly a significant event in the history of landscape painting. 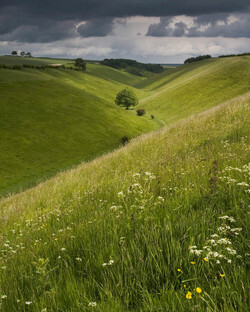 It is also playing an important role in promoting the landscape of East Yorkshire and especially the Yorkshire Wolds. This quiet but beautiful part of Yorkshire has been largely ignored by tourists but due to the Hockney exhibition is now gearing up for an influx of visitors keen to sample the landscape he has been painting for the last eight years. 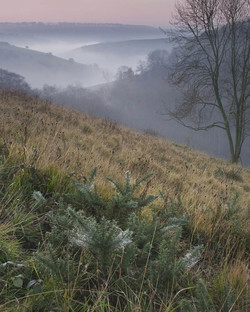 As some may know I too have spent the last eight years on a different journey into the Wolds landscape, mainly searching and photographing the steep sided dry valleys hidden below the chalk upland. I’ll discuss my reasons for photographing such a quiet and relatively un-dramatic part of the British Isles later in this article but for now I’d like to expand on the landscape work of David Hockney. Over the past few weeks there have been countless newspaper, television and internet articles about the exhibition which is the first major event in the 2012 Cultural Olympiad. David Hockney had been asked four years ago if he would like to fill the walls of the Royal Academy with new landscape paintings of East Yorkshire. 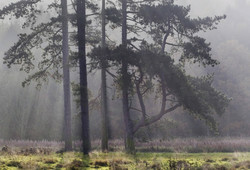 He had previously been successful with the display of ‘Bigger Trees Near Warter’ at the Royal Academy. This huge 50 canvas painting was done on location in stages over a period of a few weeks in winter and spring 2007. 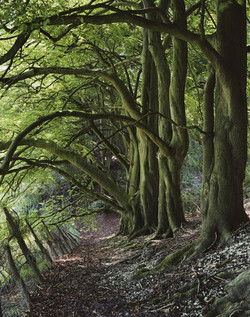 It shows towering beech trees at the edge of a junction near to the small Wolds village of Warter. 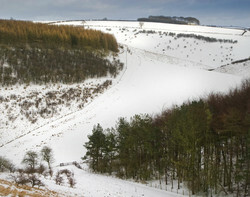 The location is fairly typical of many others around the Wolds but Hockney saw the opportunity to create a huge painting to show the colour and majesty of the trees and tangled branches stripped of foliage. He (and colleagues) used Photoshop to combine photographs of each of the partly painted canvases to re-create the finished jigsaw whilst returning time after time to add new paint strokes and to start on new sections. After finishing ‘Bigger Trees Near Warter’ he began work on another spinney of beech trees near Warter to show the seasonal changes but the four works were cut short when the trees were felled leaving him aggrieved. The current fast-selling exhibition has been received favourably by many people and some reviewers but has also been slated by others. His large joined canvas oil paintings range from clever subtle use of colour and keen observation of light to surreal psychedelic studies using an exaggerated palette. His brushwork harks back to the Impressionists, most notably Van Gogh, but he also pays homage to the Fauvist movement’s use of bright colours. Whilst they bare little resemblance to the traditional English landscape work of Constable and Turner there is no denying their presence and impact. As a founding member of the British Pop-Art movement in the early 60s Hockney has now re-invented landscape painting to suit his own radical style and vision. It has certainly sent the art world into a spin and delighted most of the public. 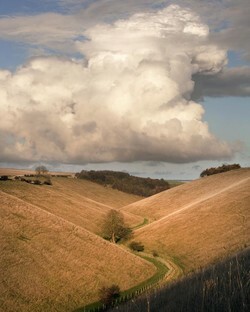 I discovered Hockney’s Wolds paintings shortly after I had begun to explore my local area for photographic subject matter. A friend had shown me a series of Hockney’s early watercolours of views I knew well and they certainly captured the look of the Wolds beautifully. 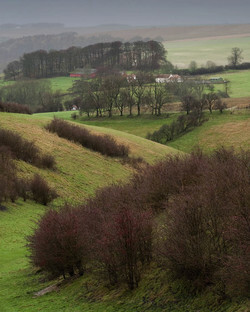 I had no idea that Hockney was continuing his Wolds period only a couple of miles from my home near the village of Warter. 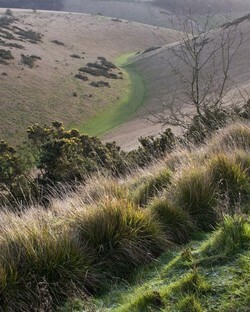 I had become far more pre-occupied with my own journeys into the Wolds landscape. 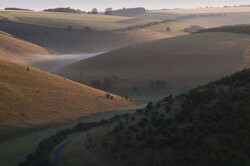 I had become aware of the vast areas of Access Land in the dry valley systems that scatter the Wolds but remain virtually invisible as you drive over the arable chalk upland. 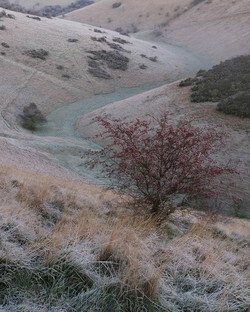 The valleys are used for grazing livestock and I’d visit and photograph them with the intention of showing the wonderful geometry and the colour that existed all year round. 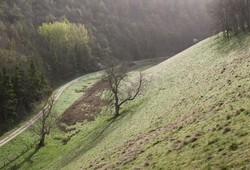 I would walk miles down quiet and peaceful dales searching for subject matter and the best viewpoints. 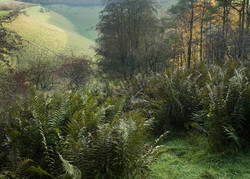 I’d pour over O/S maps of the Wolds searching for hidden locations then visit and re-visit at all times of the day and throughout the year. I began to know when and where I should visit to catch the best conditions. 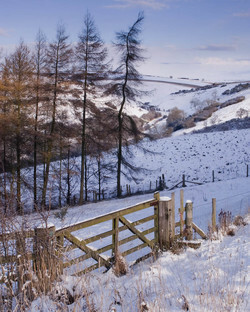 I learnt all the Tolkein-esque names - Scoar Dale, Frendal Dale, Sylvan Dale, Great Dug Dale, Horse Dale, Thixen Dale (named for its six joining valleys) to name but a few. Each valley has its own individual look and feel - some are barren and beautifully desolate, some are complex and varied where each new twist reveals a completely different eco-system of plants and trees. I began to coincide my visits with the seasonal events I’d witness. Wild garlic, hawthorn blossom, rosebay willow-herb, ox-eye daisies, harebells, ferns and hawthorn berries provided me with scope for variety in my photography. 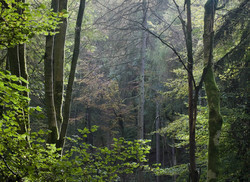 Without mountains, rivers, waterfalls, lakes or rock formations to photograph I had to adapt to what was on offer. This brings me back to David Hockney and specifically his well-publicised views on photography. According to Hockney photography is all but dead. He has been vocal in criticising the camera’s single viewpoint (hence his series of ‘joiners’ made in the 80s) and the single timeframe of the photograph. Perhaps he should investigate the work of many photographers who take advantage of equipment to drastically lengthen the exposure time, varying it from several seconds to one year in a single image or move their cameras whilst exposing the shot to create blurred effects and impressionistic studies! This opinion does no justice to Hockney or to the important role photography has had in shaping our lives over the previous and into the current century. It also demeans the already hard work that photography galleries in this country have in convincing the art world of its validity as an art form. 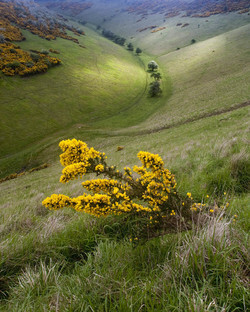 As a landscape photographer I’m fully aware of photography’s limitations. It can never replicate the real sensations of a place but neither can painting nor filmmaking. 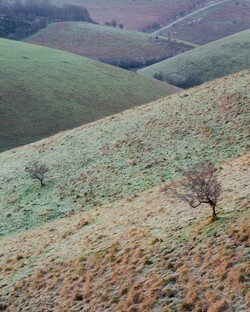 All three are only capable of creating an impression of being in the landscape. The truth can only come from experiencing the landscape first-hand. All the experiences of being in the landscape can never by gathered from a single image bound by a frame but does that make photography pointless? Whilst it cannot create the feeling of being out in the open air, the one thing it can do is give you the feeling of WANTING to be out in the open air. Wanting to see the subject for ones-self and revel in the experience of being there. This brings me to my own reason for wanting to photograph the places I see on my travels. 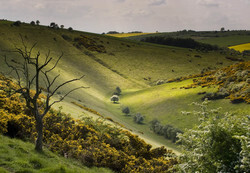 My photographs do remind me of where I’ve been and the wonderful times I’ve had in the landscape but I also want others to see what the Yorkshire Wolds has to offer. It’s not about one single image. 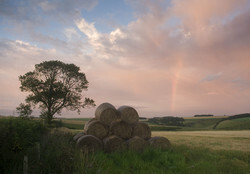 My photographs around the Wolds were taken over many years in the areas I visit at all times of the year. To show the wonderful variety of subject matter, weather conditions and light you have to produce a large body of work, not a single shot. Only then can people begin to see the dramatic and subtle changes I see on my travels. A recent article on the Guardian website really caught my eye. Some of the East Yorkshire residents were interviewed after visiting the Hockney exhibition. Whilst they all praised the work they had seen the most telling comment was that it ‘made them wish they were back in East Yorkshire’. 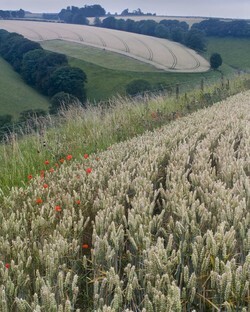 That must be the greatest compliment paid to Hockney about his East Yorkshire landscape work. I’d like to hope they, and others, would also feel the same way if they were confronted with wall-filling landscape photographs from their locality (unless it was a Gursky!). 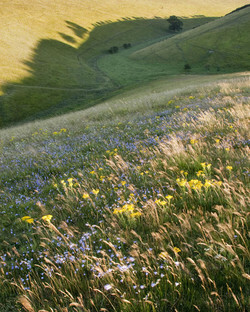 I hope the exhibition will encourage people to begin to experience the landscape and see it with fresh eyes. I know that many landscape photographers already appreciate the wonders of nature, light and the climate as do many non-photographers (ie. artists, naturalists, walkers, climbers) but I hope it convinces others to look a little harder and appreciate and cherish their own immediate landscape. I’d also like to encourage other photographers to look closer to home. 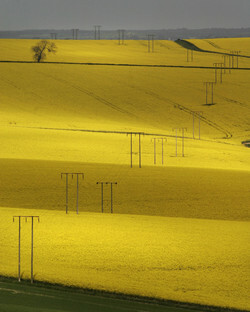 I know of many who do and have been rewarded with some wonderfully creative photography. By putting yourself out of the comfort zone of traditional landscape photography locations you will be forced to look harder and in return begin to see more. That is what Hockney has achieved by putting himself into a landscape that isn’t overtly dramatic. 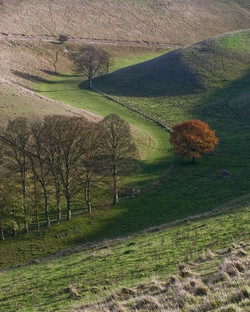 East Yorkshire residents have always been justifiably proud of this quiet, secret landscape and we are glad that someone of Hockney’s stature has recognised the Wolds undeniable beauty. His motives are purely for pleasure, not for profit, which is an endearing quality. It’s not every day that Britain’s greatest living artist makes his home on your doorstep. It’s also nice to know that the English landscape has found a new spokesman, despite his curmudgeonly views. I’ll forgive him for his views on photography because there’s so much more to admire in him than to dislike. 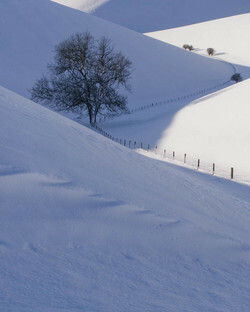 I only hope he continues to produce work around the Wolds as I hope there will be better to come. I’ve included a selection of some of my favourite views and some of the conditions I’ve had the pleasure to experience on the Wolds. I know one man who’ll hate them! I’d be interested to hear anyone’s views on Hockney’s work, his views and the exhibition if anyone has been or is planning a visit. See also www.hockneypicture.com. 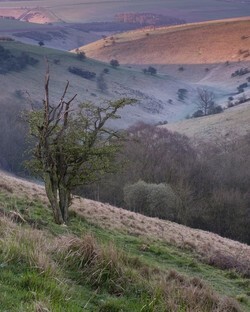 Which has a few of the Wolds paintings buried away.